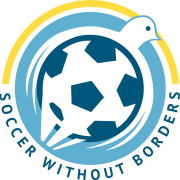 Soccer Without Border (SWB) uses soccer as a vehicle for positive change, providing refugee, asylee, and immigrant youth with a toolkit to overcome obstacles to growth, inclusion, and personal success. SWB utilizes the global power of soccer to create positive life changes through five key programming areas: soccer play and instruction, off-field lessons and academic tutoring, civic engagement, team building, and cultural exchange. SWB serves middle-school and high-school students. The student-athletes who make up the program have recently arrived to the US from a variety of countries, including but not limited to, Cameroon, Eritrea, Somalia, Rwanda, DRC, Congo, Tanzania, Ethiopia, El Salvador, Mexico, Sudan, Guinea, Iraq, Bhutan, and Nepal. While these young people come from diverse backgrounds, they share a passion for soccer and a genuine interest in and desire to engage with their new surroundings. I have been volunteering with Soccer Without Borders this summer. I have never been prouder to volunteer anywhere. SWB creates safe spaces for Baltimore’s refugee/immigrant youth to express themselves and be respected. Soccer is not only a fun activity for the kids, it is a tool through which they can make friends, learn English, and build leadership skills. Every student is treated with love and respect both on and off the field. Students are always welcome in our office, whether it be to do homework, get help applying for college, or to just hang out and watch a soccer game. SWB goes above and beyond the task of putting the needs of the youth first and helping them whenever possible. I have never worked for a more compassionate or inspiring organization. Getting to know the kids is so rewarding and whether you’re coahcing them on the soccer field or helping a senior apply for college, if you’re looking for an impactful volunteer opportunity that leaves you feeling good, this is it!